Many early ditches in Colorado were constructed by miners to divert stream water for their mining operations without regard for water access rights. Others were constructed by farmers who moved north from Mexico and implemented their traditional irrigation systems. Today it is no longer legal to dig a diversion ditch and help yourself to water from a river or stream, even if it crosses your property. 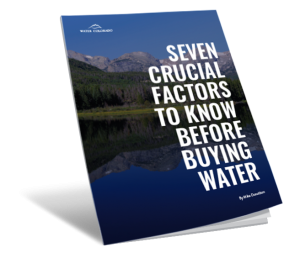 Water projects, no matter how small, involve a complex legal process of determining what water is available to appropriate, or use. That’s where ditch companies can be useful in providing water access rights to their owners. Ditch companies in Colorado purchase water rights and develop storage and delivery systems to their members, generally for irrigation purposes. Farmers or ranchers purchase stock in a ditch company and then are entitled to a certain amount of water from a ditch based on how much stock they own. They also pay annual fees that cover the use and maintenance of the ditch system, which includes the services of the ditch rider who is responsible for regular maintenance and operation of the headgates. If you hold shares to water access rights on a ditch that runs through your property, you have a deeded right to use a certain amount of water during the irrigation season. If you do not own shares on a ditch that runs through your property, you cannot take or divert water from the ditch in any fashion, yet you must allow the ditch owner or representatives to access the ditch for maintenance. If you need to contact a ditch representative and don’t know who to call, check with your neighbors first. Those who hold shares on a ditch should have that information. If you still need information, contact us at Water Colorado and we can point you in the right direction. Besline Land & Reservoir Co.
Care of North Poudre Irrigating Co.
Clover Basin Ditch & Reservoir Co.
Care of North Poudre Irrigation Co.
c/o Larimer and Weld Reservoir Co.
Gill & Stevens Ditch Co.
Johnson & Edwards Ditch Co.
c/o Louden Irrigating Canal & Res. Co.
Loveland & Greeley Reservoir Co.
Lower Arkansas Water Mgt. Assoc. McCanne Ditch & Res. Co.
Meadow Island No. 1 Irrigation Co.
c/o North Poudre Irrigation Co.
Upper Platte and Beaver Canal Co.
3127 D 1/2 Rd. / 3114 D Rd. Welch & Agricultural Ditch & Res. Co.
Care of Greeley-Loveland Irrigation Co.
Care of Windsor Reservoir and Canal Co.
Consolidated Home Supply Ditch and Reservoir Co.
c/o Windsor Reservoir and Canal Co.
Fruitvale Lateral and Waste Ditch Assoc. Goodhue and Rock Creek Ditch & Res. Co.
c/o Boulder and Larimer Manuf. & Irrig. Lower South Platte Water Conservancy Dist. Northern Colorado Water Conservancy Dist. Pioneer Water & Irrigation, Inc.
St. Vrain & Left Hand Water Conservancy Dist. c/o Cache La Poudre Reservoir Co.
Walter & Roberts Ditch Co.
Bergen Ditch & Reservoir Co.
Care of Big Thompson Ditch & Manuf. Co.
Divide Canal & Reservoir Co. Farmers High Line Canal & Reservoir Co.
c/o Pleasant Valley and Lake Canal Co.
Larimer County Underground Water Users Assoc. c/o Loveland Lake and Ditch Co.
Masonville Union Ditch & Res. Co.
North Boulder Farmers Ditch Co.
Upper Colorado Water Providers Assoc. Upper South Platte Watershed Protection Assoc. Wind Cliff Water Association Inc.